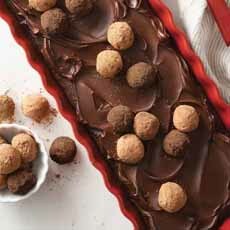  A chocolate torte—a short, dense cake—topped with chocolate truffles (photo courtesy King Arthur Flour). 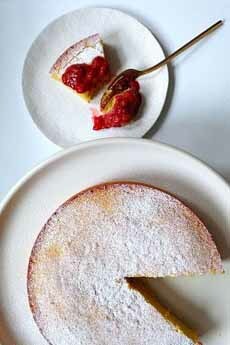 A coconut torte: one dense layer (photo courtesy Food 52). A chocolate tart. Notice the chocolate crust around the perimeter (photo courtesy Pichet Ong). 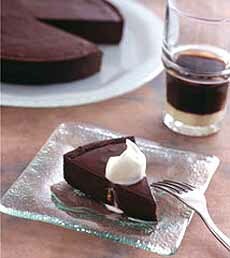 If this chocolate truffle torte looks good to you (photo #1), you can purchase all of the components in one easy kit from King Arthur Flour. It has everything you need to make the torte and the truffles, including a pound of Valrhona dark chocolate and the red Emile Henry ceramic tart pan to bake it in. Different cooking traditions led to different styles of baking, creating cakes, gâteaux and tortes. All three of these are made from cake batter, with fillings and frostings as desired. There is no crust. Torte is the German word for cake. Tortes are generally shorter and wider than cakes, and one layer. They are often unfrosted, topped with a sprinkling of confectioner’s sugar (photo #2). A torte is usually 10 to 12 inches in diameter compared to the typical 8-to-9-inch cake. That’s to compensate for the short single layer, so each short wedge will be a good portion. The Italian torta is the same concept. The single torte layer is often no more than 2-1/2 inches high, because there’s not much, if any, flour to rise. Flourless cakes are tortes. The crumb is denser than the airy crumb of a layer cake; it’s similar to the density of a bundt cake. Tortes are made with many eggs and little or no flour, using ground nuts (and sometimes breadcrumbs) for texture. Since there’s an exception to every rule, the creator of the chocolate truffle torte in photo #1 elected to use a rectangular tart pan instead of a round pan. Cake, as we know, is the English word. It is usually made from multiple layers that are taller but more airy than a torte; with filling between the layers (although there are single-layer sheet cakes and bundt cakes) and frosting on the top and sides. British culinary tradition created lighter cakes like layer cakes, as well as sturdier, longer-lasting pound cakes and fruit cakes. Tortes have the richness and density of the latter. Gâteau is the French word for cake. Gâteaux are generally more delicate confections, light and rich but with fresh decoration such as fruit or whipped cream, that makes them perishable. The French went for layers filled with custard, whipped cream or butter cream, the surface frosted, and decorated with fresh fruit. These ingredients make gâteaux very perishable. British cakes, German tortes and Italian tortas are hardier creations than delicate French gâteaux. Tart has only a bottom crust. A tart crust is different from a pie crust. A tart crust is firm and enables the tart to stand on its own, outside of the baking pan. A pie crust is soft and flaky. A pie needs the support of its baking pan. The type of pan is also different: straight for a tart, sloped for a pie. Here’s much more on the difference between pies and tarts.